Posted on March 28, 2018 by Phoebe L.
Recently, I watched the film Wonder which is told through four points of view: Auggie for most of the movie, his older sister Olivia, or “Via”, her friend Miranda, and Jack Will, a boy that will be revealed later on. The story is about Auggie who has a facial deformity. Because of this, he was homeschooled his whole life. However, his mother thinks that since he’s going into the fifth grade, which is the start of middle school, he should attend a public school. Before school starts, he meets Julian, Charlotte, and Jack Will. Finally, the first day of school rolls around. However, it doesn’t go too well for Auggie since all the kids avoid him like the plague. Soon, he becomes friends with Jack Will. Auggie’s favorite holiday is Halloween. It’s his favorite holiday because he can wear a costume where no one can see his face. The day before Halloween, Auggie tells Jack that he’s going to dress up as Boba Fett. But, his dog Daisy threw up on his costume, causing him to reuse an old Ghost Face costume. However, a secret ends up being revealed causing Auggie to freak out at school and having to come home. He’s so upset that he even doesn’t want to go trick or treating. His sister ends up convincing him to go by giving him some of her candy. Throughout the movie, Auggie is tormented mainly from Julian and his “gang”. Some of the things were seriously messed up like photoshopping Auggie out of the class photo! As the movie progresses on, we see the different obstacles everyone faces, like a loved one passin and someone’s first main role in a play. This film has some great laughs, friendship, some romance, and some tears. This movie changed the way I see the world and how I see others a little. 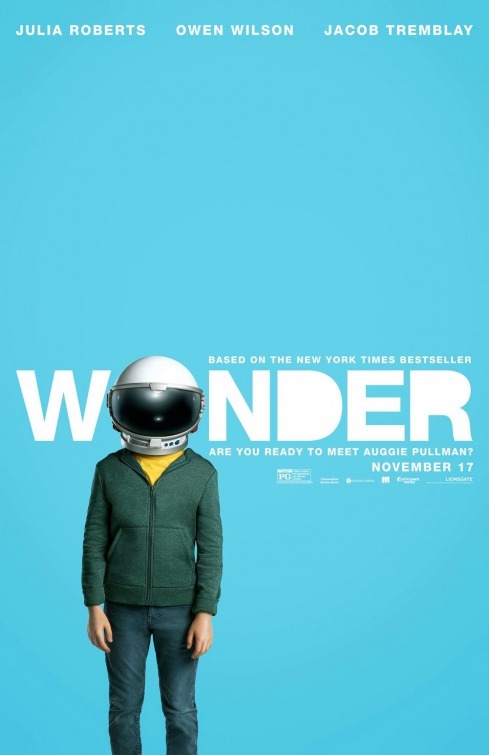 If you’re looking for a great movie to watch, I recommend the movie, Wonder. On second thought, read the book first, because the books are always better than the movies (sometimes). Posted on August 9, 2017 by Elina T.
He’s battled dragons, fended off numerous Dementors, and even faced He-Who-Must-Not-Be-Named multiple times in the flesh. Harry’s been through quite a lot for a sixteen year old boy, and now he is entering his sixth year, nearing the end of his time at Hogwarts School of Witchcraft and Wizardry. This year is different though. As it is now known publicly that an infamous dark wizard is at large once again, the quest to defeat him once and for all has become ever more imminent. Dumbledore begins showing Harry what he knows about Tom Riddle’s past in the hopes that it will help him understand how this dark wizard must be defeated. However, much of it is speculation and guesswork based on the memories that Dumbledore has procured over the years relating to Tom. Unfortunately, a vital piece of information is still missing, and Dumbledore assigns Harry to retrieve it. As if this were not enough for Harry to worry about, he still has to fulfill his role as captain of the Gryffindor Quidditch team and all the stress that comes with recruiting new members, cope with the increasing amounts of work they’re being assigned for classes, deal with Ron and Hermione’s intermittent bickering, and pursue his hunch about what Draco Malfoy might be up to. As with all the other books in this series, I really love how J. K. Rowling so seamlessly intertwines so much humor and thought into such a complex story line. Though the danger of an extremely skilled and dangerous wizard is constantly looming about, Ron is still there eating and making snarky remarks, while dealing with his own problems having to do with girls. Hermione, too, is always there to keep Harry and Ron on top of their school work, and even often correcting their papers. I think this book is amazing, as all the others are, and I’m always laughing out loud at what the characters do and think. I always have to tell myself before I watch a movie that has been adapted from a book that they can’t keep every single detail from the book and put it in the movie. It’s just not possible, especially with this book which is about 600 pages long. Keeping this in mind, I have to say that I really enjoyed the movie. I think that the director did a great job at choosing what to put in the movie and what might not have been as relevant (of course, being a huge fan of the book, I’m inclined to think that everything is relevant, but again, it would be impossible to keep every single detail). I think that the movie definitely sticks to the main story line and includes all the necessary information needed to understand the plot. But the wish is always in the back of mind of being able to watch a Harry Potter movie in which every single detail from the books is preserved. Even if it were five hours long (or longer), I would still watch it – over and over again probably. Harry Potter and the Half-Blood Prince by J.K Rowling is available for checkout from the Mission Viejo Library. Posted on April 9, 2017 by Katharine L.
When I heard out that this book had been made into a movie, I knew I had to read it. So there I was, checking the book out of the library and I was completely hooked the second I started. I have always loved dogs and the way the author, W. Bruce Cameron, wrote this story is just fabulous. I have no idea how he could write this heart-warming tale from a dog’s point of view so well and accurately! It amazes me, and sometimes I wonder that maybe he is part dog! The main character is a dog that has been reincarnated four times! The dog comes back each time because he is trying to fulfill his purpose. 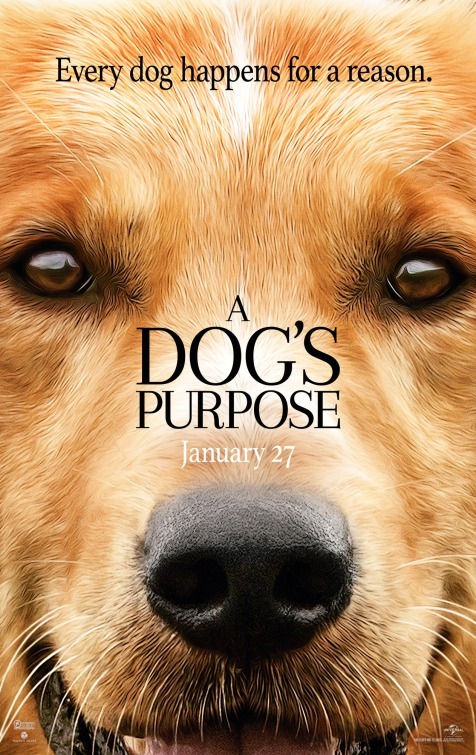 Basically, he is seeking “a dog’s purpose in life” in his different reincarnations. In the dog’s first life, he is born as a stray mutt named Toby. His mother has warned him to beware strangers, that man is not to be trusted. However, after getting severely bitten by a malicious dog, Toby lives a tragically short life. But the story doesn’t end there. In his second reincarnation, he is a Golden Retriever named Bailey, a purebred retriever. He is sold, and finds a loving home with a boy named Ethan and his parents. Bailey loves his boy Ethan, and they spend almost every moment together, their bond inseparable. They also love to play the game Rescue Me, where Bailey jumps into the lake to save Ethan. In his third life…he’s a girl. He’s a German Shepherd named Ellie, ready to save and to Find people and rescue them. She realizes that this is similar to rescuing Ethan, and does her job and saves many lives until her own ebbs away. And in his final life, he’s a male again, this time a black Lab named Buddy. Ethan is now an old man, and Buddy is determined to be with his boy once more. He treks a long way, and he finally finds Ethan in the town that he once knew, and he realizes nothing changed much. Buddy also finds an emptiness inside of Ethan, and decides to bring him his old girlfriend, Hannah, hoping that will fill up the void of emptiness. The two get married, and Buddy realizes that he has truly fulfilled a dog’s purpose.